Tofu has become a very popular food throughout the world, widely known for its health benefit. And unlike the most parts if the world, you can get a freshly made tofu in any supermarket. The difference in price usually comes from whether they are mass produced or not. The more expensive tofu will be using non-GMO domestic soy beans, and may be organic. Still, even if you buy the most expensive ones on the shelf it is still cheaper alternative to meat and other protein sources with less calories. Kinugoshi Tofu （絹ごし豆腐） Silken Tofu, Soft Tofu – for salads and hiyayakko. Labeled "絹ごし" or "きぬごし"
Momen Tofu （もめん豆腐） Firm Tofu – For stir fry and cooking. 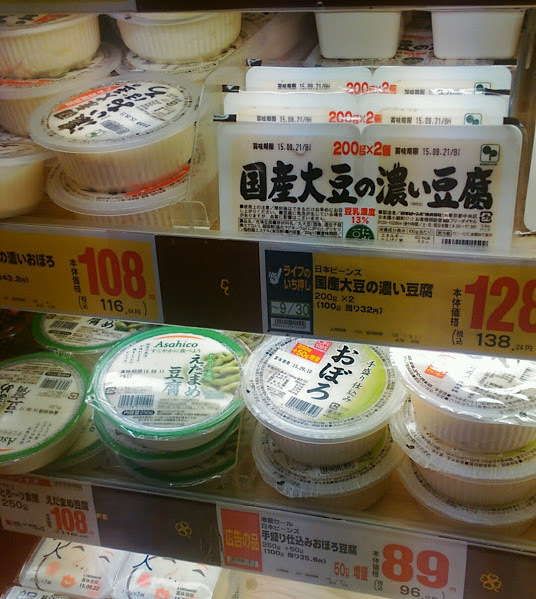 Labeled "木綿" or "もめん"
Nutrition wise, because of the difference in the manufacturing process, the momen tofu (firm tofu) contains almost double the protein and vitamin E and 3 times more calcium than the kinugoshi tofu (soft tofu). Whereas the soft tofu contains more Potassium and water soluble vitamins such as vitamin B1 & B2. 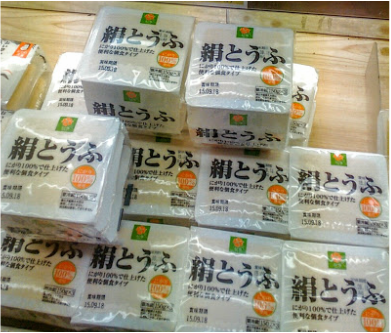 Shima Tofu （島豆腐）– Very firm tofu from Okinawa, mainly used for stir fries. Sukiyaki Tofu 【すき焼き豆腐）- This Tofu is pre-grilled and is mainly used for sukiyaki. Oboro Tofu or Yose Tofu or Zaru Tofu（おぼろ/寄せ豆腐/ざる豆腐）Fresh Tofu – usually eaten at it is. In a round package. Goma Tofu （ごま豆腐）Sesame Tofu – usually eaten as it is. The good news that no matter which kind you happen to buy, they can be eaten raw, stewed, pan fried, deep fried or any way you like. The round packages are the Fresh Soft Tofu "Oboro/Yose/Zaru Tofu"
If you decide to cook your tofu, it will need to be drained as contains a lot of water. If you omit this process, you may end up with a very soggy stir-fry, or a tofu that is too soft. The draining will firm up the tofu and prevent it from falling apart when cooked. There are several methods of draining a tofu and the recipe will usually tell you how to drain. Here are the methods. 3. Press Drain - Wrap a block of Tofu in a kitchen towel and place a plate on and under the tofu. Place about 1 Kg weight on the top plate and leave for 20 – 30 minutes. 4. Boiling - Place Tofu in a pot, pour water until it covers the top. Bring to boil, simmer for 3- 4 minutes.